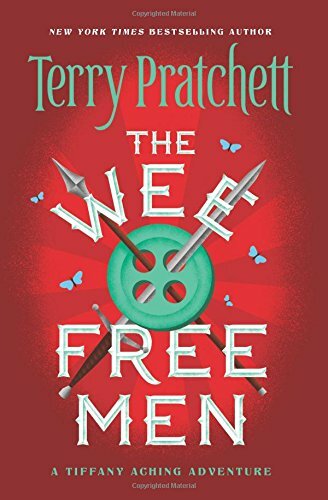 The first in a series of Discworld novels starring the young witch Tiffany Aching. 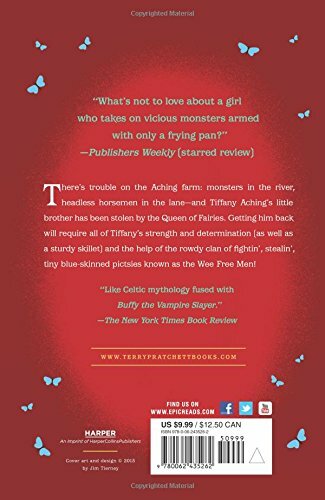 A nightmarish danger threatens from the other side of reality. . . .
Armed with only a frying pan and her common sense, young witch-to-be Tiffany Aching must defend her home against the monsters of Fairyland. Luckily she has some very unusual help: the local Nac Mac Feegle—aka the Wee Free Men—a clan of fierce, sheep-stealing, sword-wielding, six-inch-high blue men. Together they must face headless horsemen, ferocious grimhounds, terrifying dreams come true, and ultimately the sinister Queen of the Elves herself. . . .